Welcome to Week 2 of the CAL! I hope you’re enjoying the crochet along so far! If you haven’t hopped on over to the Facebook group – you can join here to share your progress and to ask questions! Also, I’ve seen people in the group sew the appliques on with thread, which is genius! You can sew them on using a running stitch (just back and forth through the square) and you won’t see where you sewed it! 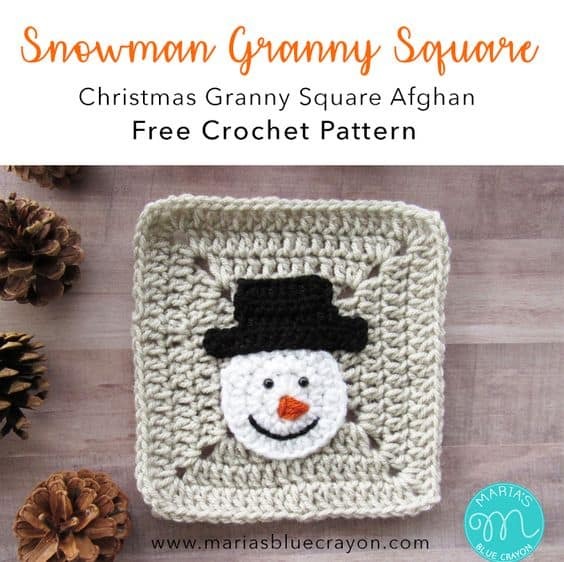 This week we will be working up 8 granny squares and the Snowman Applique. If you need to go back to the main page of the CAL to see previous weeks – click here. Using black yarn and tapestry needle, sew on mouth using a back stitch along the curve between the 2nd and 3rd rounds of the head. You may need to disable your ad-blocker if you are not able to access the video tutorial below. Or you may view the video here on YouTube.